I am going to accumulate forecasting bits and post them here. Once I've got a reasonable sample, I'll consolidate them so we can keep a tally. Strong mobile market, IoT not enough to spur stronger IC growth rate increases. Figure 1 shows the IC market size at the beginning and end of each decade since the 1980s and the corresponding CAGR for each 10-year period. IC Insights recognizes the importance of the endpoints chosen for each CAGR and how they can easily sway the data to look very good or simply mediocre. For this figure, end points were selected based solely on the start and end of each decade. • The 1980s were characterized by the relatively new but rapidly growing personal computer market and strong demand for computer memory like DRAM. IC market CAGR was nearly 17% in the 1980s. • In the 1990s, Intel and AMD battled in the microprocessor space to provide the greatest PC MPU horsepower. Meanwhile, Microsoft introduced new operating systems every two to three years and each upgrade required a big boost in DRAM to run the systems efficiently. CAGR averaged 13.6%. • The first decade of the new century was not kind on the IC market. Things started great in 2000 with 35% IC market growth, but two global recessions—one in 2001 due to the dot.com bust and the other due to the severe financial meltdown that started in 2008—prevented the market from gaining any traction. Continued flat or falling IC ASPs later in the decade resulted in the IC market showing a paltry 0.5% CAGR from 2000-2009. These setbacks started a trend of significant company consolidation within the IC industry. • Following the recession in 2009, the IC market rebounded with 33% growth in 2010. Fewer suppliers and modest capital spending have had a positive impact on IC ASPs since then. While demand for standard PCs (desktops and notebooks) has cooled, the market for tablet computers and smartphones has remained hot. Sharing data on mobile/wireless devices and growing interest in the Internet of Things—connectivity to everything—will give a boost to IC market. Total IC market growth this decade is forecast to average 4.1% per year. 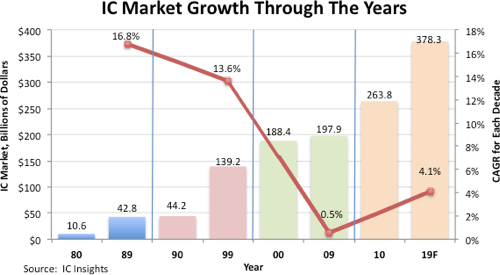 Over the past 30 years, the IC market has averaged 9% annual growth, but over the past 10 years, it has exceeded that 30-year average growth only one time (in 2010). Annual IC market growth rates are forecast to remain at or below the 30-year average (9%) through 2019. Additional details regarding IC Insights’ 2015-2019 IC industry market forecasts are provided in The 2015 McClean Report. In addition to the seminar, a subscription to The McClean Report includes free monthly updates from March through November (including a 250+ page Mid-Year Update), and free access to subscriber-only webinars throughout the year. An individual-user license to the 2015 edition of The McClean Report is priced at $3,590 and includes an Internet access password. A multi-user worldwide corporate license is available for $6,590.